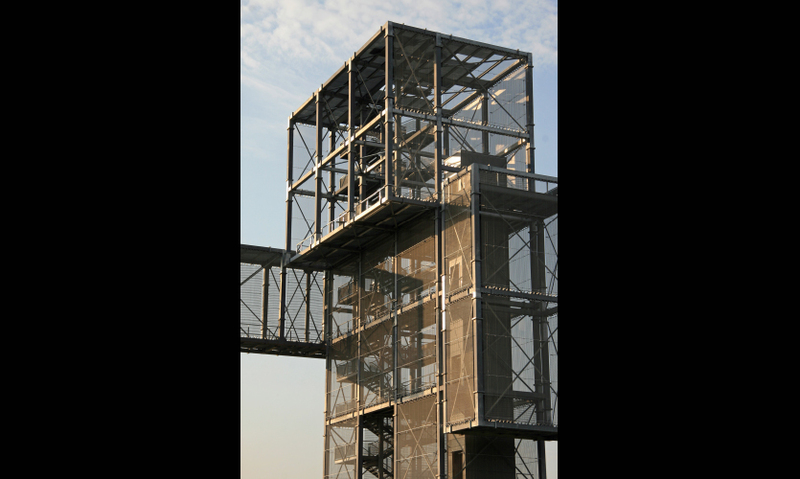 Located in Inden, Germany, next to the A4, one of Europe’s busiest motorways, the Indemann Observation Tower is a popular tourist attraction featuring three observation decks that provide visitors with breathtaking views of the region. 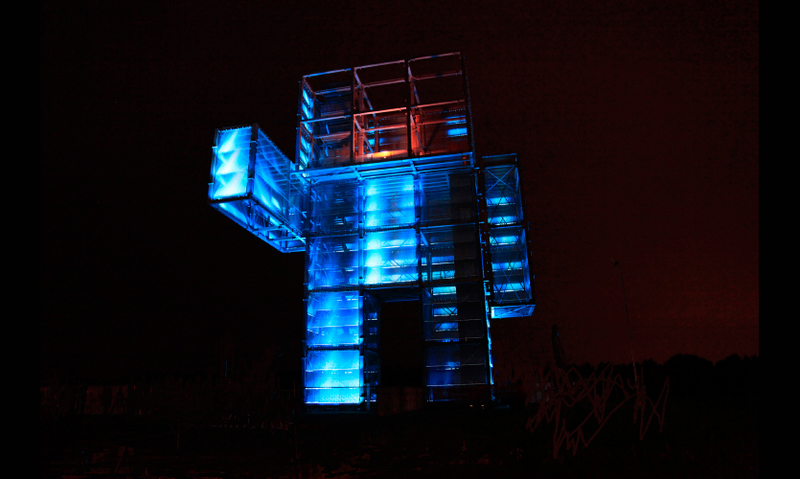 Designers created the sculpture to resemble a primitive robot extending its arm to point out the area’s evolving landscape. Their goal was to create a symbol of the structural-political evolution of a former mining district and for the 118-foot (36-meter), 270-ton Indemann to serve as an elaborate, visual representation of progressive planning for the future. While the size and shape of the Indemann is impressive, it is its semitransparent skin of stainless steel mesh with forward-mounted LED profiles that truly sets it apart. Clad in approximately 15,822 square feet (1,470 square meters) of this unique mesh fabric, the metallic surface of the structure shimmers during the day, while the reflectivity of the woven stainless steel skin dissolves the Indemann’s strict geometric silhouette, blending it into the surrounding landscape. At night a spectacular computer-controlled light show comes to life as vast light and color compositions are projected onto the shimmering material by 256 LED heads positioned in front of the stainless steel mesh. The intensive colors reflecting off the round stainless steel wires create the impression of a three-dimensional hologram. With more than 40,000 LEDs, each of which can be separately controlled by computer, the system’s long-term benefits include minimal maintenance and power consumption. This advanced LED and mesh system not only provides advanced graphic image resolution, but also low maintenance operation and economic benefits. 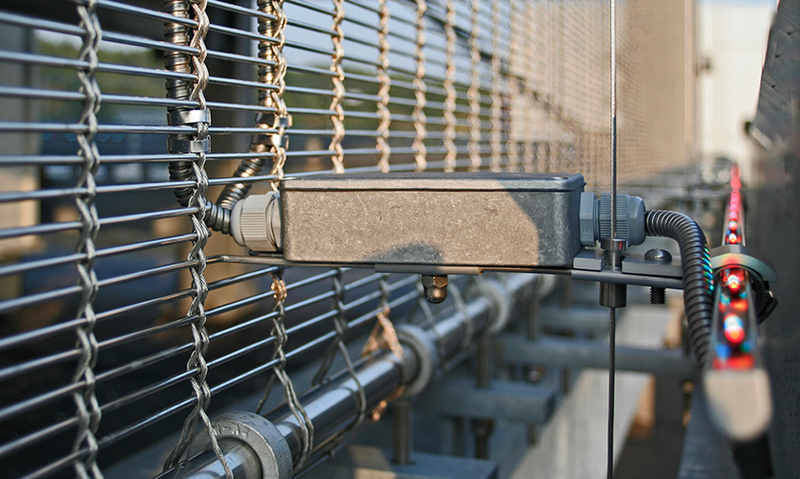 The mesh itself is resistant to weathering and temperature, helping prolong its life. In addition, the mesh functions as sun protection or climate membrane. 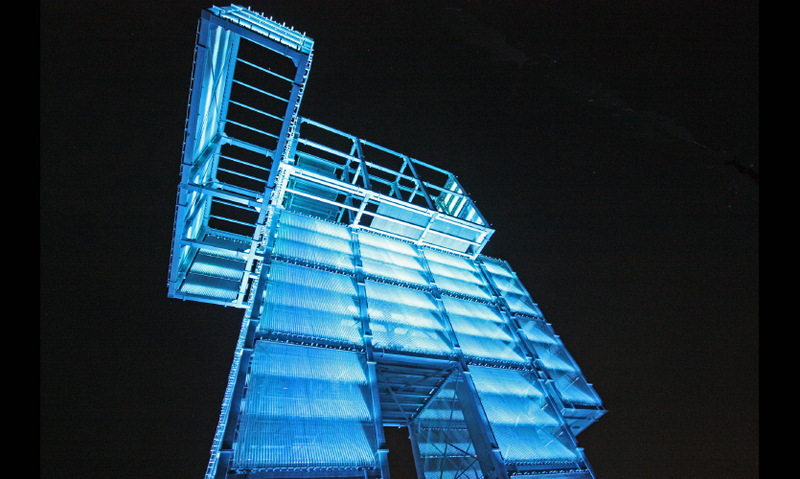 The LED pixels imbedded in the mesh consume far less power than a traditional LED board, conserving energy and making the Indemann Observation Tower an environmentally friendly work of art. The Indemann’s media façade took approximately six week to install and the project was completed in June 2009. 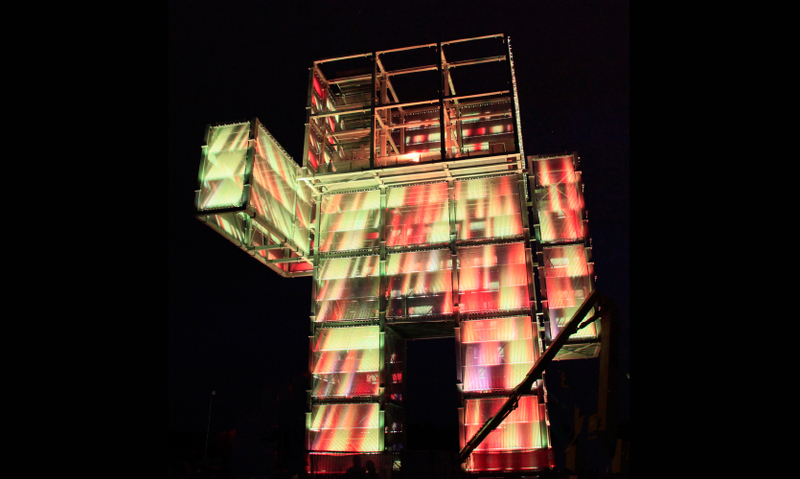 It has brought the region to life, prompting tourist activity and introducing an innovative method of achieving art and aesthetics through mesh.